I ask you, O Best Beloved 7-Imp Readers: Are you following the Top 20 Children’s Books of 2010 this week over at 100 Scope Notes, brought to us by two intrepid school librarians (with most excellent taste, I might add, not to mention a keen eye for kickin’ children’s lit), Travis Jonker and John Schumacher? It begins here, and you may have just heard me cheering loudly over today’s post, numbers 5 to 1. 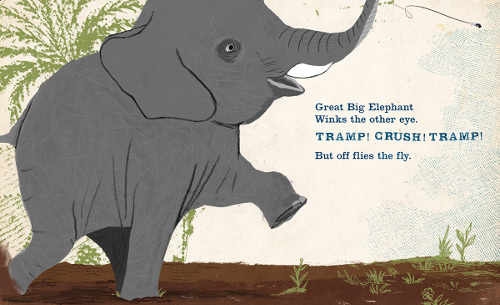 I can enthusiastically get behind the picture book titles on that short list. 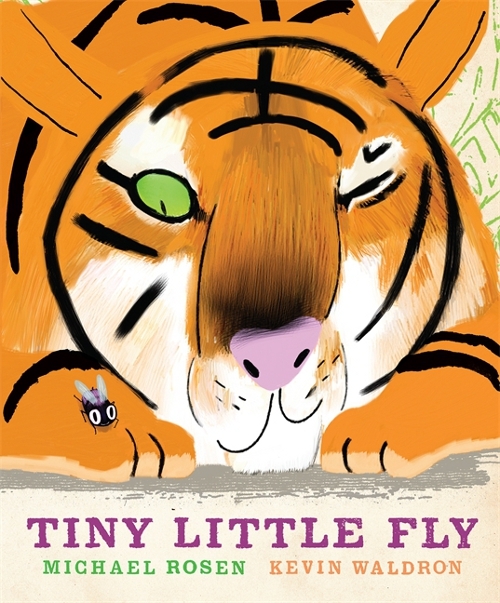 Well, in his new illustrated title (also the first U.S. edition), written by the great Michael Rosen, Tiny Little Fly, Waldron shakes things up with an altogether different style. You really must hold this book in your hands. Waldron’s illustrations, rendered in pencil and painted in gouache (and digitally enhanced), are big and bold and will wake you right up. This is the jaunty, rhyming tale of Tiny Little Fly, who pesters a great big elephant, a great big hippo, and the great big tiger you see in the spread opening this post. Each creature does its best to shoo away the fly—with lots of invigorating snatching, swooping, tramping, crushing, squashing, and rolling—but each time the resourceful fly gets away. Are you thinking what I’m thinking? Yes, the tinier listeners in your lap or listening at your story time will find this one super special empowering, the notion of the small guy outwitting the massive ones. As Mary Harris Russell points out in the Chicago Tribune, Rosen and Waldron reverse the more conventional association of size and power in the animal kingdom. As my remarkably uncreative post title tells you, I love it when an illustrator surprises readers. 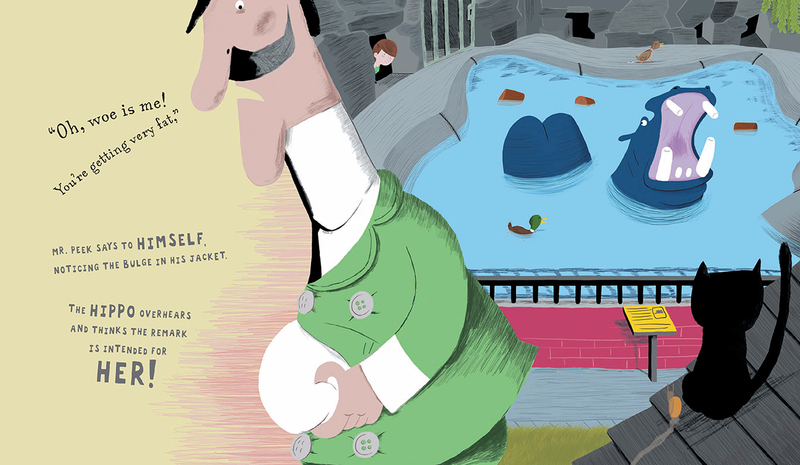 This is one thing I love about the work of contemporary illustrator David Ezra Stein (who visited me with quiche in 2008): He switches up his style just enough with each new picture book to surprise you, yet you still know it’s the inimitable Stein. (I still think a Caldecott is in that man’s future. Think this could be his year? Who knows, but I digress.) So, yes, I did a double-take when I saw this new illustrated title from Waldron, given the very different vibe of Mr. Peek, but it’s a good kind of surprise. And I very much look forward to what Waldron brings us next. TINY LITTLE FLY. Text copyright © 2010 Michael Rosen. Illustrations copyright © 2010 Kevin Waldron. Reproduced by permission of the publisher, Candlewick Press, Somerville, MA on behalf of Walker Books, London. 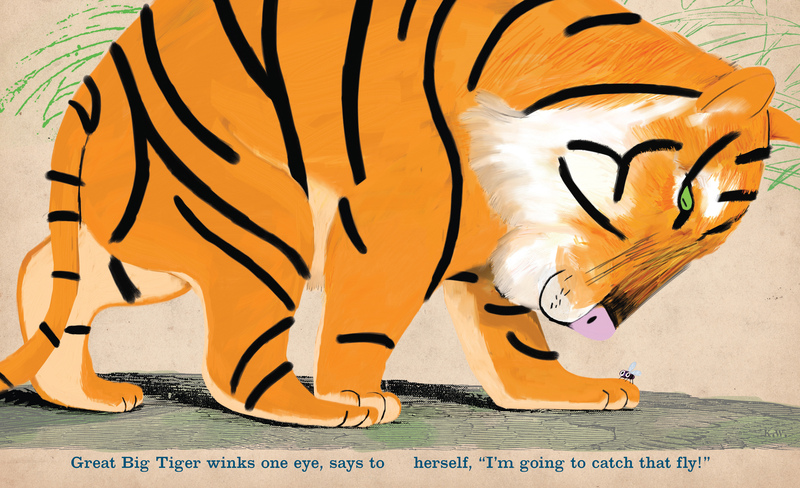 Jules, this looks like a wonderfully written and designed book with wonderful illustrations by Kevin Waldron, a hard-working and inspired illustrator. My only complaint is that his work is inspired by very clear antecedents and I cringe when I see it published and praised as fresh or original. I know, we all are standing on the shoulders of giants! Maybe if he dialed back the faux old and tattered paper texture style I’d be a little more sympathetic. Actually, illustrators respond to very complex forces as they figure out how to get their work to market and make a living. So, perhaps instead, my querulous and cranky comment here is aimed more to the publishers: What’s with the tattered and retrograde that we find so charming and safe? Real books have to get loved to look this way. Rob, interesting. I guess that’s a question for a publisher to weigh in on. When I wrote that he shakes things up with a different style for this book, I meant within the context of his own career — meaning, the style for Mr. Peek is so different from this new title. Perhaps I wasn’t clear. While I like the book a lot, I’m not asserting that he necessarily breaks any new ground with it, illustration-wise (with regard, that is, to your “fresh and original” comment). Is your question to publishers specifically about the look of the illustrations — when you say “tattered” and “retrograde,” that is? Just trying to get clear on your question. Thanks for your food-for-thought. Oh Jules, it IS a good book and I share your delight when an illustrator pulls a rabbit out of their hat and surprises us. I regularly depend on this freedom to keep myself engaged in illustration: I’ll do whatever to keep the ball rolling and the story & characters alive. I often think of Paul Zelinsky in this regard. My question really was for a publisher or designer to ponder. And it’s really a larger issue that verges on philosophy: We artists use computers in some way to make or process our illustrations. It’s the workflow but I find it interesting that, as a culture, with the thousands of dollars of technology humming away at our fingertips, that artists (and their patrons) value, more and more, digitally created art that mimics decidedly lo-fi, pre-digital stylistic conventions. And with Waldron’s illustrations, this extends to the condition of the paper itself. My own little theory, is that we live in scary times (wars, oil spills, economic collapse, facebook, etc.) and that this “look” is basically a nostalgic decision that is meant to appeal to a certain demographic. OK, I’m off my soapbox; time to ponder my “kicks!’. One more thing: Candlewick is one of the absolute best American publishers I know. Their lists are great and always surprise me. So really, my “gripe” is really more of a musing on why are things the way they are. Thanks for the shout out! Also, thanks for highlighting a few books that seemed to go under the radar a bit this year. Fun to read, as always. Thank you so much for sharing this book. Interesting thread on the retro-style illustration. Yes, it does pay tribute to that classic Golden Books art style of the 50/60s…but there is still something very original about it….the blurring and scratching adds a unique touch. The technique of starting with gouache and then digitally enhancing is interesting. I really want to get this book to take a closer look. Thanks, Don. Let me know what you think after you see it!